I wanna eat TOFUUUUUUUUUUUUUU. Who says tofu isn't good? 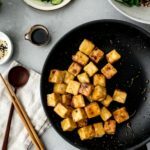 I dare them to try this crispy pan-fried tofu and not like it. 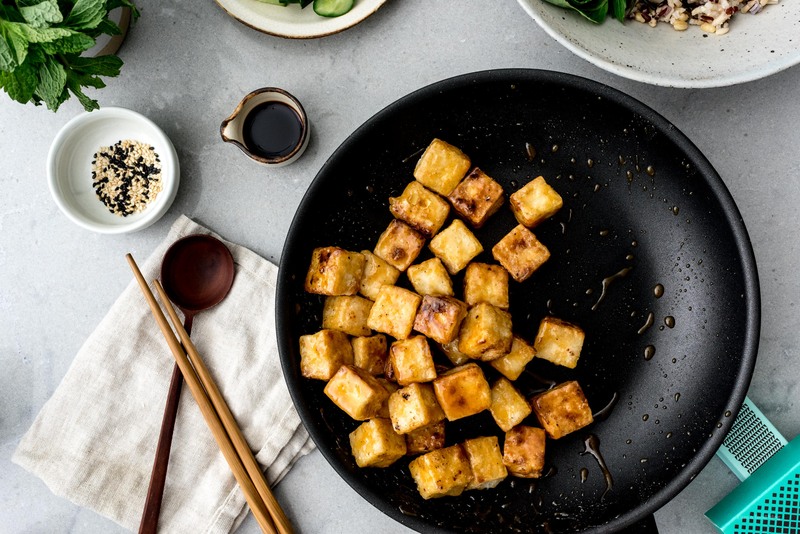 Crispy pan-fried tofu with a sweet and savory miso glaze. Perfect for a grain bowl or alone as a snack. 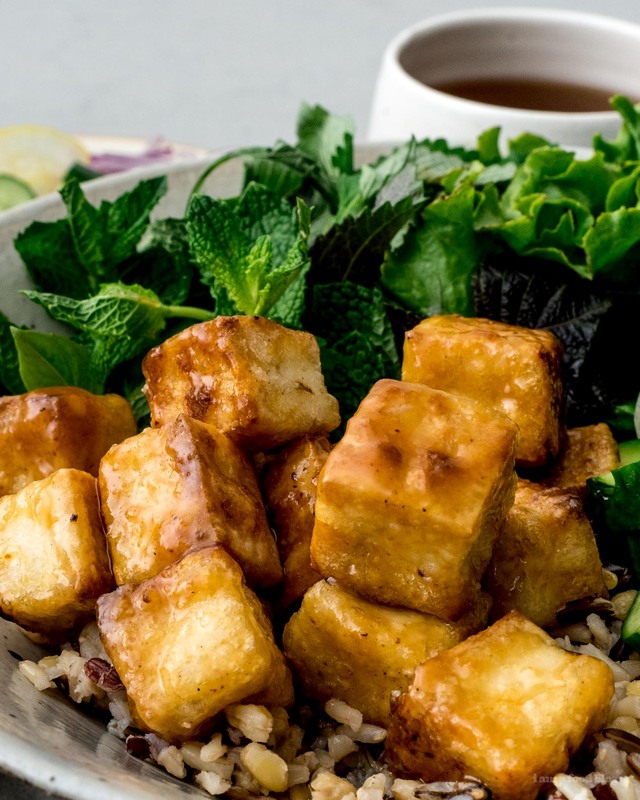 If you love crispy tofu, you’ll love this quick and easy crispy miso glazed dish. 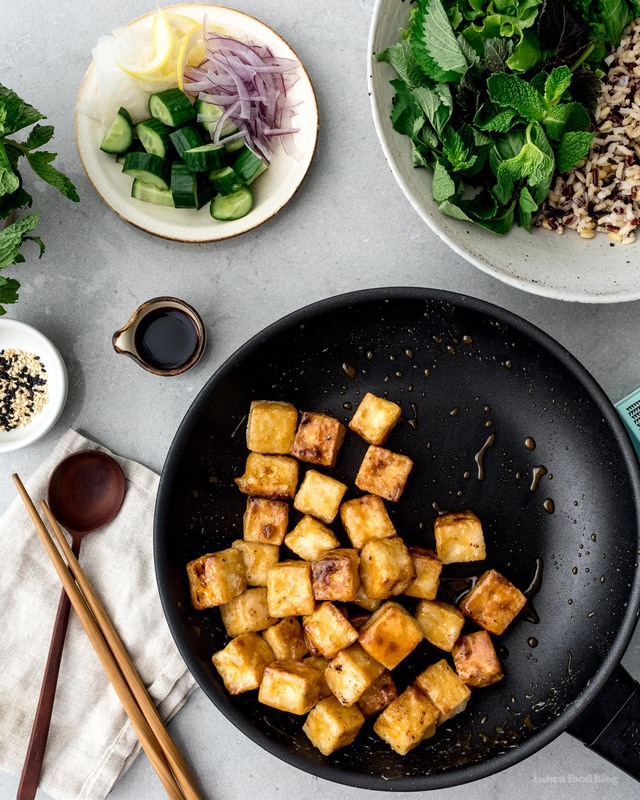 If you’re not into miso, just make the crispy tofu – you only need three ingredients (not counting salt and oil) and you’ll have the crispiest tofu bites you ever did have! Do you love tofu? I never really get it when people tell me they don’t. It’s the perfect blank canvas for flavor and it has the best texture. Usually when people say they don’t like tofu I mostly think it’s due to the texture, but to me, the texture is the best part. 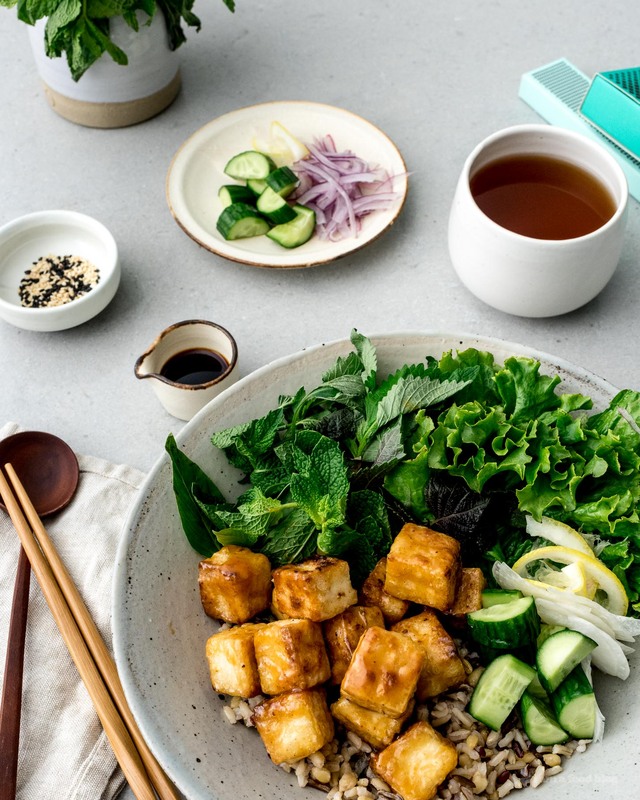 And the thing is, tofu has just about every texture there is: soft and creamy, substantial and firm, crispy and deep-fried – the tofubilities are endless. It really is one of the most versatile ingredients out there. 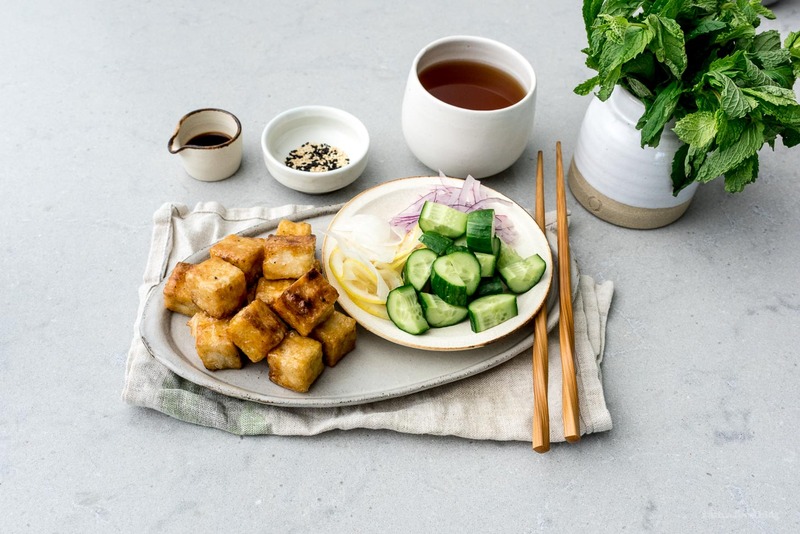 Crispy tofu is probably the gateway tofu, so if you know someone you want to introduce to the addictive world of tofu, serve them some of these crispy tofu bites and there’ll be no turning back. All you have to do is, make sure the tofu is crispy. The surface of the tofu needs to be dry so that it can crisp up. Water equals soggy and tofu comes packed in water, so you need to eliminate some of that water so that you can crisp it up. If you’re new to the tofu game, the best tofu to use is firm or extra firm just because it’ll be easier to handle. You don’t need to press firm or extra firm tofu, just cut it into cubes (or slabs or whatever you’re going for) and lay it out on paper towels for a couple of minutes. You’re just minutes away from crispy tofu heaven. Use a mix of potato starch and cornstarch for the ultimate crunch. Cornstarch – as opposed to flour or breadcrumbs – gives this crispy tofu a light crunch. The potato starch lends a little bit of heft and helps the tofu hold maximum crispiness. You could go with all cornstarch, but I find the mix works best. Best of all: this crispy tofu is completely gluten free. Let the tofu rest on a rack before saucing it. Letting your tofu chill out on a rack for a little while before tossing it in sauce is the best possible thing you can do to maintain crispiness. Definitely don’t let your tofu hang out on a plate; it’ll just end up with soggy bottoms from steaming. Also, if you toss the crispy cubes in sauce before they have a chance to set up a bit, the sauce will soak right through the crust that you just fried up. That’s it! Go forth and crispy tofu ALL THE TOFU! Drain the tofu well on paper towels: place a couple of paper towels down on a plate or cutting board and lay out the tofu. Place a couple of paper towels on top. They idea is that you’re drying it out slightly – you’re not pressing it, just removing some excess moisture. Pressing removes most of the moisture from tofu, which is NOT what we want here. Leave it a bit moist, this ensures a soft and creamy tofu interior that will contrast with the crunchy cornstarch/potato starch coating. Cut the tofu into small 1/2 inch cubes. Mix the cornstarch, potato starch and salt in a bowl or shallow dish. Toss tofu in starch mix, ensuring there are no bare spots. In a non-stick pan or cast iron pan, heat up a bit of oil over medium-high heat. You don’t need a bunch of oil here, just maybe about 1 1/2 to 2 tablespoons. When the oil is hot and shimmery (you can test it with an uncoated wooden chopstick – when the oil is hot bubbles will form around the chopstick), add the coated pieces of tofu and cook until golden brown and crispy. Time wise, this can vary, but tofu is quite forgiving as it doesn’t brown easily. Flip and brown all the sides. Rest tofu on a wire rack – the rack will keep the tofu bottoms from getting soggy and letting the tofu rest before saucing also ensures crispiness. While the tofu is resting, make the sauce. Place the mirin and sake in a small saucepan and bring to a simmer over medium heat for 2 minutes. Add the miso and stir until smooth. Stir in the sugar, and reduce to low. When bubbles break the surface, the glaze is done. Remove from the heat. Toss the tofu in the sauce and enjoy as is, with toasted sesame seeds, or on top of your favorite grains with a bunch of vegetables. 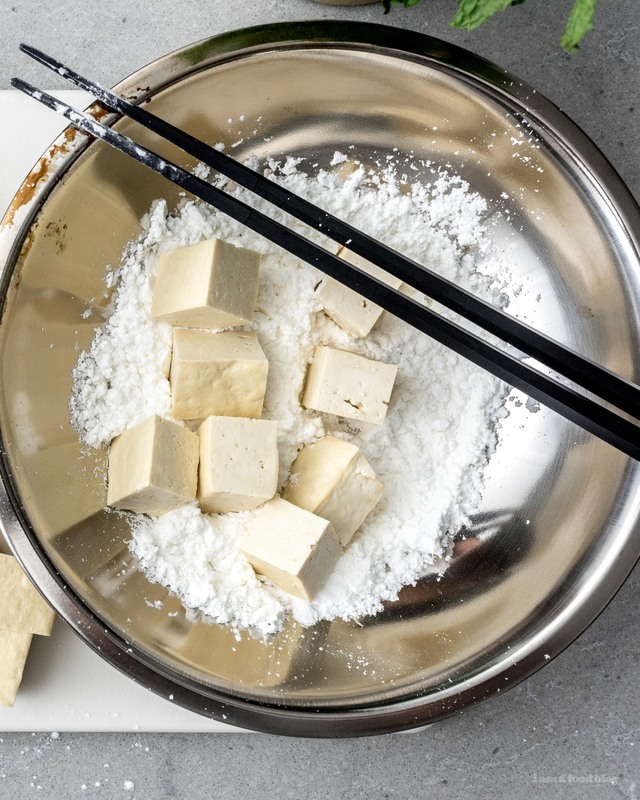 Thanks so much for sharing how to cook tofu this way! Looks delicious. Can’t wait to make this at home.